- "...Only train in the company of Tedd Verres." I had originally planned for it to take longer to get to this idea of Elliot's, but then I had a bunch of trouble writing the real start of this storyline in general (shockingly, writing an intentionally cliche short transformation story was not a challenge). I'm not going to say it's a "good" thing Ashley isn't comfortable going back to Elliot's house just yet, but it's really convenient for getting the party planned for Tedd's house when the party was Elliot's idea. 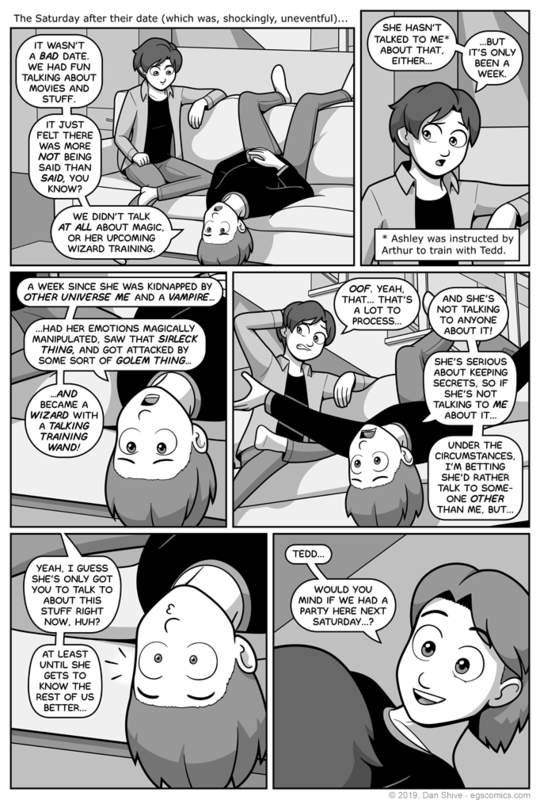 If not for that, there'd probably be a page just devoted to why Tedd's house and not Elliot's. Not that Tedd would have strong objections. It would just have to be addressed logically, because that's how I roll. Given the situation, however, "why Tedd's house" is established (or, at least, why NOT Elliot's house), so YAY! I mean, not "yay", but... You know what I mean!